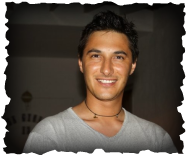 I’m an Italian guy in my mid thirties who currently lives in London and has a great passion for Lego sets and has been collecting pirates and castle sets for more than 20 years. I’m not going to bother you with my CV or with any uninteresting news about my work (which has nothing to do with Lego or toys of course), but I would like to tell you the story of my Lego collection. Before starting there is something it is really important to point out: I’m not a mere collector and by that I mean someone who is buying Lego sets, building them and putting them on the shelves. Instead I rather define myself as a “Lego based story builder”: since I was a child I bought Lego sets and I collected them but in the meantime I invented stories around them and each set I added to my collection was also a part of the story I was developing. Maybe in the future, time permitting, I will write a book based on all these adventures, but in the meantime this is the reason why you will find, in the following chapters of this page, the story of my collection as part of a larger story which involves both pirates and knights characters based on the Lego sets I bought through the years. 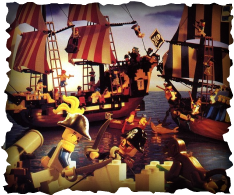 It was 1989 when the first pirate Lego set arrived in my house. 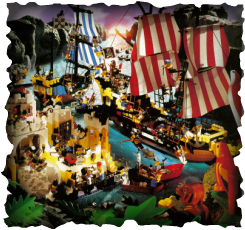 It the 6260 Shipwreck Island, a small set indeed but with containing a lot of interesting “pieces” considering the small size of the set: there were two pirates, a parrot, a monkey, a treasure with gold, a palm and a cannon. As a child I had quite many other Lego sets before, I played with them and basically, after a short period of time, I got rid of them by “destroying” the sets and putting the pieces into boxes (this was of course a task up to my mother while the first one was mine...). 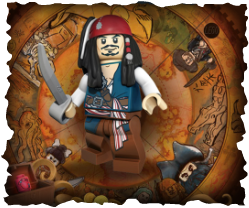 Anyway this Lego set made me passionate about pirates and not only I played a lot with it imagining many stories and adventures, but I decided that I wanted more pirates sets and that I would like to start a collection. Between 1989 and 1991 I began collecting all the pirates and imperial soldiers sets released and finally I got the Black Seas Barracuda set: I can still remember the excitement while building it and I still consider it the best Lego pirates set I had ever had. As mentioned in the introduction, the adventures behind the collection continued and basically there were about the everlasting war between pirates and imperial soldiers in the West part of the world of Altaria: the first ones (leaded by Captain RedBeard) fighting for their freedom and trying to conquer the Eldorado Fortress and the second ones (leaded by Governor Broadside) with their small Caribbean Clipper trying to sink the Black Seas Barracuda. The most famous battle is probably the “Eldorado Fortress Assault” in 1990 in which the pirates assaulted for a week without success the fortress defended by the imperial soldiers but they almost sunk the Caribbean Clipper and took the captain of the ship as a prisoner (he was later released after paying a huge amount of gold). In the meantime, as my passion for Lego was growing, a new collection started: the classic castle collection! And of course another was just going on in the East part of the world of Altaria : the Black Knights vs. The Crusaders. The Black Knights were under the reign of the Black Dragon Knight and lived in the Black Monarch Castle; their main purpose in life was to defeat Richard the King of the Crusaders who lived in the King’s mountain fortress with his daughter and the ghost of his grandfather (the founder of the order of the Crusaders). It is still remembered the“Black Monarch Siege” in 1991 when the Crusaders put the Black Monarch Castle under siege for two months and only the bravery of the Black Knights (and also a bit of luck...) made the castle not to be taken and the war ended. Last but not least, just in the middle of the war and well hidden in the forest, there were the Forestmen, a bunch of people leaded by Jack the Archer Master and always trying to escape from being captured, especially by the Crusaders. 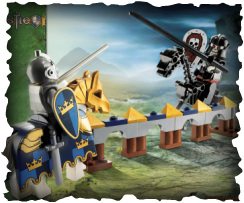 So in conclusion on the one hand this was a period of war and conflicts, but on the other hand it could also be seen as the beginning of a Lego Empire, because the collection was expanding rapidly, on the pirates side as well as on the castle side. I like to call this period “The Golden Age” because it is probably the period in which my Lego collection reached the highest splendour and visibility. The first part of this period is characterized by the continuing of the war on the two sides: Pirates vs. Imperials and Black Knights vs. Crusaders. Both Captain RedBeard and Governor Broadside realized that they have to expand their army in order to win the war. The pirates worked on a double plan: on the one hand the leave their relatively small base (The Forbidden Island) to a bigger and more defendable one (The Rock Island Refuge), on the other side another big vessel was built, the Skull's Eye Schooner and Henry Morgan was named captain. The expansion on the Imperial side was even more radical: Governor Broadside decided to create a completely new army, the Imperial Guards of which Woodhouse was named Admiral; moreover, in order to increase their commerce and therefore their revenues, one big harbour, the Imperial Trading Post was build. The Imperials also realized that the Caribbean Clipper, although under the guide of the expert Major Stede Bonnet, was not enough to defeat the Black Seas Barracuda; therefore under the command of Captain Edward England another vessel (not to big either but very fast) was build: the Imperial Flagship. The war on the castle side was kindly to be decided by new alliances: in 1992 the Black Dragon Knight made a pact with Cedric the Crow, the king of the Black Knight’s Castle and this treaty is remembered as the “Monarch and King’s Treaty”. The Crusaders fearing to be overthrown and not having such powerful allies, didn’t wait too much to try to convince the Forestmen to come into their side. Jack the Archer was strongly against this alliance because he wanted the Forestmen not to be involved into the war, but a part of his men, leaded by the so called WolfLord were corrupted by the Crusaders gold. So in 1992 they leave the Forestmen’s River Fortress and made the so called “Schism of the Forest” becoming Crusaders’ allies as the WolfPack and making the Wolfpack Tower their new base. Then, as sometimes happens in history, it was time for pause and reflection. It was almost five years that the war in the West seas was going on and an end or a victory of one of the two factions was a mere dream: the pirates were dominating the seas but in the meantime they didn’t succeed in conquering any fortress of the imperials; the imperials were able to increase their commerce and to gain enough money to build up new types of defences against the attacks of the pirates but they were not strong enough to defeat them and put into prison. And what about the war in the East? So many battles, so many strategies, so many casualties and of course no victory of one of the two kings. 1993 was a key year in the history of the Lego empire and is considered by some historians the year of the real birth of the Lego empire itself. In 1993, after a long council on a neutral island, Captain RedBeard and Governor Broadside signed e peace treaty and give birth to the “Western Seas Federation”: all the islands and fortresses of the region were divided between the two factions, the imperials gained unconditional control of the commerce and of the economy, pirates obtained the amnesty for all their crimes and the charge of the defensive army of the Federation. In 1993 another peace treaty was signed between the Black Knights and the Crusaders and they gave birth to the “Council of the Kingdoms”: the three main kings, Black Dragon Knight, King Richard and Cedric The Crow agreed to form a council in which all the important matters, such as economy, internal and external politics, religion, taxes, war, culture… should be decided. Also the forestmen and the wolfpack were invited to be part of that council, but if Jack The Archer at the end accepted the invitation (although with the exemption of some matters such as war) the WolfLord preferred to stay out putting also an end to the alliance with the Crusaders. So this was the period of health and expansion in the history of the Lego empire and so no surprise in the fact that is remembered as “The Golden Age”. Turning back at the real life and at the pure story of my collection, I would like to point out that the number of my Lego sets was dramatically increased since 1989 and therefore I decide to refurnish my bedroom: many big shelves were build in order to put all the sets and I created a dedicated section of the room for the pirates sets and another one for the castle sets. Each section was theme based decorated and the appearance of my collection looked great. Driven by high expansion targets and by the confidence in a wonderful future, the Lego empire experienced a period of peace and collaboration. In 1995 the Council of Kingdoms approved and exploration and communication campaign in order to expand itself all around the East. Already since 1993 a new member was admitted in the Council: his name was Saphirus and he was a very powerful and mysterious wizard who leaded the so called Dragon Knights. The Dragon Knights lived in the Fire Breathing Fortress in the very north of the East and were famous, a part for the wizardry, for their unique ability in talking to and training dragons which they used as they were horses. Anyway the most important and most tangible results of this newly approved campaign was the “Royal Engagement”: Myriam, the daughter of King Richard got engaged with King Leonidas the king of the Royal Knights who lived in the Royal Knight’s Castle (the biggest castle ever constructed and also considered as the most beautiful and elegant one). King Leonidas not only became a new member of the Council but it was also the one who convinced all the others that the world in the Caribbean seas (about which only legends and stories were told) was worth to be discovered and it was time to try to organize an expedition. In the meantime in the western part of the world had already organized and completed many expeditions in order to expand their trade routes and make new discoveries: Admiral Woodhouse in particular had build the Imperial Outpost under the command of Commander Robert Easter to increase their presence in the North America’s territories. Moreover to have a specific focus on the expedition campaigns they created the Imperial Armada and they built a dedicated vessel: the Armada Flagship under the command of Ponce De Leon. In 1994 a huge expedition was organized by Captain RedBeard and both the Black Seas Barracuda and the Skull's Eye Schooner sailed to explore and conquer the Southern part of America. After about two months they discovered a new population in a group of islands in the Atlantic Ocean. They were called the Islanders and were under the government of King Kahuka who lived in his palace in the Enchanted Island. They were more a tribe than a modern population: very religious people who considered their King as a god and believed in the spirits of nature. They have faith in the future and due to this the word “past” was banned from their language: for example instead of saying that it is “ten past four in the afternoon” they say it is “minus ten to four in the afternoon”. Other peculiarities of their language were the absence of the letter “n” (substituted by “m”) in many words and also a particular form of the verbs “to be” and “to have”: the above sentence would have been “i i mimus tem to four im the aftermoon”. The real mystery about the islanders was King Kahuka himself: he seemed very different for his own people like he came there from somewhere else, he spoke many languages and had a great culture and he was aware of history, especially the pirates’ one. It was then no surprise the fact that he was very keen on joining the Western Seas Federation by signing the“Pact of The Island”. 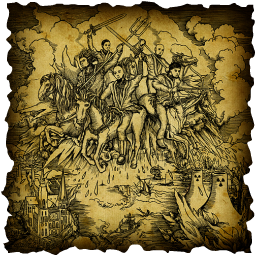 In 1996 pirates and imperials were convinced that it was time to go east and to finally discover the so called “world of the kings”: so many stories were told during the years about these knights, their castles and their almost invincible land army. By the way the world was changing and it was not possible any more to be confined into the Western territories. After the formal approval of the Federation, RedBeard built two new vessels: the big and fast Red Beard Runner under the command of Captain William Kidd and the Renegade Runner (already built in 1993 by made more powerful to sustain the Ocean voyage) under the command of Captain Avery. So the “Myth Crossing Expedition” started and all the pirates’ and the imperials’ vessels sailed to the east and reached the coasts of the East where all the knights were expecting for them. And they were not expecting with friendly intentions: they saw these vessels as an army ready to invade and conquer their lands and they were ready to defend themselves. A huge army leaded by the Black Dragon Knight and King Richard and the other kings was ready to battle! The “Blooded Red Sea Battle” was fought: the biggest and most cruel battle ever fought in Lego history; in the firs days of the battle the pirates and the imperials took advantage on their position in the sea because the attacked the knights army with all the cannons of the vessel while the army of the castle was not able to defend itself and so had many losses. But then Major Bonnet and Captain Kidd decided to ashore and to finish the enemy on the land, soon followed by the rest of the Caribbean army. As soon as they reached the coast were attacked by the knights and their horses in the front while hit by thousands of arrows from the sky and they had to escape back on their vessels. The battle continued for weeks without any real winner: at a certain point the pirates were able to advance and put under siege the Black Monarch Castle but were then attacked by the dragons of Saphirus and forced to retreat. Dark Ages were coming but the real question is: how could such an empire decay and disappear? The answer is quite complicated and there is not only one clear reason. The Lego Empire in 1997 was covering and ruling quite the whole world of Altaria, trade routes were established across the five continents and there was no enemy so powerful to be considered as a real threat. On the other hand you have to consider also the fact that the same empire was a mixture of forces so culturally different and not (due to their history and also to their DNA) so keen on accepting compromises and on renouncing on their independence. The result of this is that since 1997 the first discrepancies began to emerge: the members of the former Council of the Kingdoms did not like to see other leaders from another continent interfere with their internal European matters; pirates considered themselves the real leaders (the primus inter pares) of the Confederation and always try to define the strategy of the Confederation while the Imperials wanted to put Governor Broadside as President of the Confederation. So, like in many modern parliaments, internal unofficial and even secret alliances were formed: parties were born inside the Confederation, parties whose main target was only to gain more internal power and not to operate for a better government. Another cause of the falling of the Empire was the strong cultural differences within the Confederation: pirates and imperials shared the same background while kings had a totally different one. The wizardry was for example something really difficult to accept by pirates and imperials and therefore Saphirus and his knights were never really accepted or considered as real members of the Confederation. The same was for the Islanders who were considered quite as a minor tribe not worth to be part of the Confederation. Moreover we cannot forget about the Forestmen and the WolfPack who joined the Confederation only formally but continued to live and act independently from the laws and the others. Coming back to “real life” you have to consider the fact that I started university and then I began to work and so not only passion but also time for Lego collecting were fading: the first step was that I stopped buying new sets (pirates set in particular were not released any more while the new castle sets were more kids than collector oriented) and that the actual ones began to be dust covered. The second step was the decision in 2003 to refurnish the room: all the sets were put into big boxes and transferred in the attic of the house. The last step was in 2008 when I left my parent’s house and therefore all the boxes remained there. To quote the Lord Of The Rings “And some things that should not have been forgotten were lost. History became legend. Legend became myth”. So this was the end of the Lego Empire and nobody remembered its splendour. It lasted almost a decade but now nothing remained of the Confederation: the vessels were sunk, castles destroyed and where one there was culture and power now there was ignorance and oblivion. 2011… fifteen years after my last purchase of a Lego set… my life was so changed: I grew up, moved to London and got married too… Lego were only a memory of the past… But then something strange happened: first of all I read an article about the fact the Lego released some sets based on the movie Pirates of the Caribbean (movies that I saw and I liked very much especially for the characters and the atmosphere and which reminded me about the times of the Lego Empire); then one day not too much after that, when I was back in Italy to visit my parents, my mother told me that the week before my little cousin came there and, in order to let him play, she took out of the box and gave him one of my pirate Lego sets: the Shipwreck Island! I thought it was a sign of the destiny and it was time to bring the Lego back: so I came back to London and I began to buy the Pirates of the Caribbean Lego sets and in the meantime I took advantage of my holidays periods in Italy to take my collection out of the boxes, rebuild the sets, checking that they were all complete, cleaning them from the dust of 15 years and adjusting my old room to contain all the collection. Anyway just a few weeks after this meeting Carl Stronghold, Admiral of the Imperial Army, officially communicated that he was sailing with his ship, the Great Imperial Flagship, on an expedition to the East to conquer all these lands under the Imperial Empire It was also rumoured that he will have as a prisoner an unknown pirate captain who knew where to find even the lands in the North. Among the legends in Altaria one of the favourites (especially among pirates) was the one concerning the huge treasures of the Confederation and therefore Paul Cavendish was soon approached by the captain of the Black Pearl, the famous Davy Jones who heard about his map and offered him to come into the expedition and divide the eventually found treasures. In the meantime also Blackbeard arrived pretending to have already an agreement for the expedition with Cavendish. It started a fight with sabres but at the end the decided to sail together for the “”Two Captains for Three Ships Expedition”: Jones and Blackbeard would have divided the treasures fifty/fifty and the would have provided a new vessel and a crew to Cavendish. The pirates sailed in 2012, just a few months after the “Stronghold Army Expedition” of the Imperial Army: pirates and Imperial Army sailed together but with different routes and facing different difficulties and their expeditions ended in totally different ways. Admiral Stronghold, thanks to his mysterious prisoner, found the Islanders before and then went to the East and discovered the various kingdoms. The took all the countries with the force and they subjected the population to their rules forming the “Empire of the Army” with Stronghold as Emperor; the Black Dragon Knight, King Leonidas, King Richard, Credric the Crow and all the others kings (including also the forestmen and the wolfpack) were not strong enough to resist the power of the Great Imperial Flagship and were easily defeated; on the other hand it turned out that King Kahuka already knew the English Army and was very keen on joining the Empire without any kind of resistance. The voyage of Cavendish and the other pirates terminated in the West, where they were able to find (not without many difficulties) the pirates and the imperials. They came for gold but they found friendship and became almost immediately friends with Captain Redbeard and Governor Broadside: they formed the “New Caribbean Seas Federation” and helped them to restore the harbours, repair the vessels and, instead of spoiling their treasures, they began to trade together. They also soon heard about the conclusion of the expedition of Stronghold and what happened to islanders and kingdom and therefore decided that it was time to go for the Great North but also to free their former allies and release the Lego Empire from the power of Emperor Stronghold. In conclusion the Lego Empire was in a certain way restored and was experiencing a period of Renaissance but it was indeed divided within two factions and not all the populations lived in a free world: the “War of The Seas” was the only possible solution. And besides all there were still unanswered questions: who was the mysterious prisoner of the Imperial Army? Who really was King Kahuka and what was his past? Will the Great North be discovered? What will be the future of the Lego Empire?